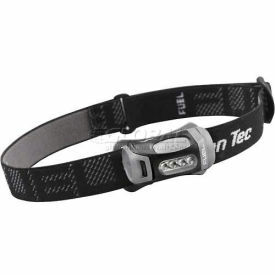 Princeton Tec® FUEL™ Headlamps are lightweight and convenient for a wide variety of uses. 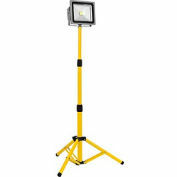 Lights are made with 4 ultrabright LED's, and provide an output of 70 lumens with a burn time of up to 146 hours. Lamps feature three brightness settings, as well as a pulse setting. 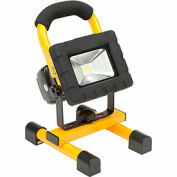 Flashlight unit is Level-1 waterproof, making it impervious to splashes or quick dunking. Headlamp weighs only 78 grams for comfort during long-periods of use, with an easily adjustable headband for a customized fit. Operates with 3 AAA batteries (included). MODE TYPES"High, Medium, Low, Strobe"
I have regularly used headlamps for field work for years. 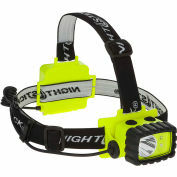 This headlamp is by far one of the best I have used. It is bright, lightweight, compact, and comfortable to wear. Being an LED means that the light is bright, minimizes weight, and battery life is maximized. Your review: I have regularly used headlamps for field work for years. This headlamp is by far one of the best I have used. It is bright, lightweight, compact, and comfortable to wear. Being an LED means that the light is bright, minimizes weight, and battery life is maximized. Your review: Bought this for reading in the dark in bed as to keep from disturbing my wife with a big light. Works great but just a bit too bright for this. 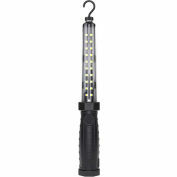 Use it when power off or looking for something in dark basement, great for these applications. Your review: This is a great product and was shipped immediately. Your review: The fuel headlamp works very well, it can be adjusted to meet the needs of any work area. Your review: Great headlight for climbing in crawl spaces and ceilings. Very bright light. 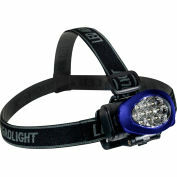 Your review: A good quality headlamp that stays in place w/bright lights. Your review: it handy for the dark side of racks. Your review: Excellent headlamp. Well made and functions well. Your review: I didn't buy just one. I bought 5 for the car, toolbox, work, home, and the kids! Makes a cheap gift! is this a class 1 Div. 1 explosion proof light? Hello Larry, This model is not a class 1, division 1 explosion proof light. 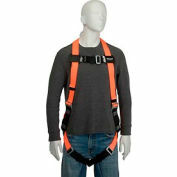 We do offer item # B2071734 which is cUL and UL approved for Class 1 Division 1 Group C & D areas. Thank you for your interest in our product!